Ways to prevent infection if traveling to an area currently experiencing the Zika outbreak, as recommended by the World Health Organization. • Wear light-colored clothes that cover much of the body. • Implement physical barriers when indoors to keep out mosquitoes, such as screens, windows and doors. • Sleep under mosquito netting when adequate household barriers are not present. • Limit mosquito breeding grounds by eliminating standing water from around the house. the Zika outbreak in Brazil is the latest health emergency to grab the world’s attention. More specifically, the risk Zika may pose to the unborn children of infected mothers is one that has gotten widespread coverage, especially as the virus has spread to other parts of the Americas, and the upcoming Olympics in Rio de Janeiro are set to bring more travelers to an already bustling area. Heightened awareness of ongoing health emergencies is always advisable, but oftentimes, facts are jumbled with correlations and hypotheses in the arena of public perception as health experts attempt to put together the bigger pieces behind an ongoing epidemic. Medical experts who study the interaction and development of viruses and diseases with populations have the task of uncovering the layers of an outbreak, oftentimes in areas susceptible to many different health risks. The current Zika outbreak is one that epidemiologists are presently trying to understand, and while the virus probably won’t be a health threat to Eagle County, the evolution of understanding the virus is equally as important as implementing policies and strategies to contain it. Zika has been around since the 1940s, with the Pan American Health Organization citing its first recorded case of the mosquito-borne virus in Uganda in 1947. Since then, the virus has popped up in areas scattered along the equator, which harbors the aedes mosquito, which is responsible for carrying the Zika virus. More recently, outbreaks of Zika virus appeared in Micronesia in 2007 and French Polynesia in 2013, with the Micronesian outbreak affecting 75 percent of the island of Yap, according to the Pan American Health Organization. The Pan American Health Organization lists the virus as usually having symptoms lasting for two to seven days, which may include mild fever, skin rashes, conjunctivitis, muscle and joint pain, malaise or headache. Many Zika-infected hosts never know they’re sick. The reasons for the spread of certain viruses, such as Zika, into different populations at different times is one that epidemiologists such as Jason Moore, Ph.D., P.A., of the Vail Valley Medical Center, study and try to understand. Moore explained that his work, much like the epidemiologists currently researching the ongoing Zika outbreak in Brazil, focuses on the bigger picture of what causes disease and viral epidemics in different areas. In an effort to comprehend the causes of different diseases and viruses, epidemiologists often try to understand the origins of a particular outbreak. Zika, like many other diseases, had quietly been present in more isolated areas, but as is often the case, increased human presence leads to the spread of different ailments. Just as humans reach into climates and terrain prone to viral outbreaks, viruses often reach out in what researchers call the “drift and shift,” which refers to the natural mutation of viruses. This viral transformation changes the way the virus then interacts with populations and can give researchers clues to better understanding current outbreaks. Moore said there isn’t much chance of Zika coming to Eagle County, as the area’s cold winters and dry climate don’t provide the right breeding ground for the aedes mosquito that carries the virus. Although some areas of the country might see more cases of Zika than others, it’s important to keep in mind the comprehensive level of health care in place to deal with potential cases of the virus in the United States. In particular, areas outside the United States where the virus has been prevalent typically don’t have widespread access to health services for much of the population, along with nearly nonexistent data that has kept track of the virus’ localized history. The United States has the ability to answer potential Zika cases with a quick and efficient response, as public health officials are in constant communication with local medical centers, and state-of-the-art facilities are able to handle and monitor an influx of patients. 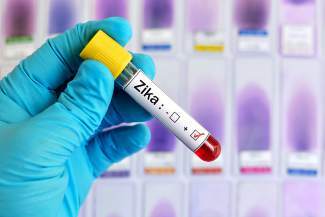 While the chances of seeing an outbreak of Zika in Eagle County are slim, the Vail Valley Medical Center has been following developments of the ongoing Zika epidemic to ensure a relevant and prepared response for any potential cases that make their way to the Vail Valley. Along with keeping a close correspondence with public health officials, the hospital’s response allows for flexibility as more information about the virus becomes available to allow for the highest level of care for potential patients. In terms of links to birth defects, such as microcephaly, an abnormal smallness of the head associated with incomplete brain development, Moore said the research isn’t there to confirm a link between the birth defect and the virus, and before a link is established, researchers will have to determine a reference point for the condition by teasing out other factors. Similarly, the Centers for Disease Control and Prevention have found that active strains of the virus can survive in bodily fluids for up to a week, making sexually transmitted Zika a possibility, although the implications of such wouldn’t be enough to create an outbreak. Overall, it’s important to put Zika’s newest outbreak into context with what researchers actually know about the virus, as there are more questions right now than answers, although health experts are quickly working on the latter.